Turkey vultures, photographed at Fort Jefferson, Garden Key, Dry Tortugas National Park, Monroe County, in April 2017. Turkey vultures don't get as much respect as they should. They're ugly and, as scavengers, they do nature's dirty work. But by eating roadkill and other carcuses, they're actually doing us a favor and keeping down disease. They do have a cool scientific name — Cathartes aura — meaning golden purifer or cleansing air. But they've also been viewed, unfairly, as a source of disease and a symbol of death. The "buzzards" in those Westerns circling overhead just waiting for the good guys to croak as they run low on water while traversing some cruel desert are probably turkey vultures. On the other hand, non-Europeans have a much more sympathetic, even admiring view of the vulture. According to Native American mythology, the sun was once too close to the earth. A fox tried to move it away and failed. An opossom tried and failed. Finally, a beautifully plumed turkey vulture successfully pushed the sun away with his head, but in the process his feathers burned, and he was made bald for eternity. The Pueblo people of the Southwest saw the turkey vulture as a symbol of purity, and used its feathers to remove evil from people and things. 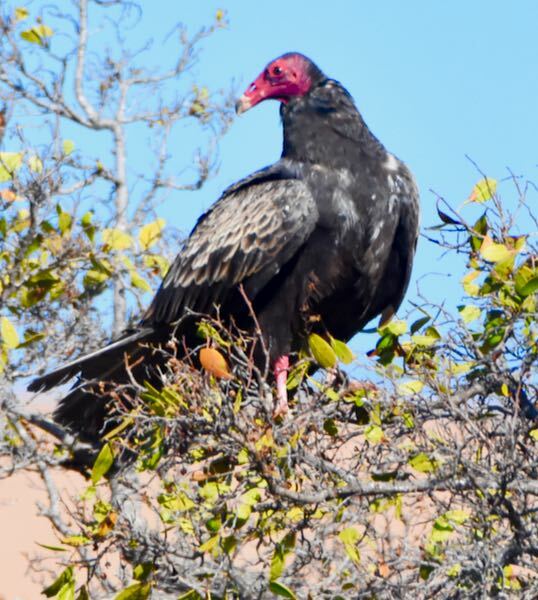 In any case, this much is true: Turkey Vultures are year-round residents of South Florida, although they seem to be more numerous in the fall and winter months, most likely their numbers swollen by migratory fugitives from the frozen north. Their year-round range extends along the Atlantic Coast into New England, through much of the Southeast, parts of the Southwest and along California's Pacific Coast. Through the rest of the United States and parts of Canada, Turkey vultures are summer residents only. They are year-round fixtures in Mexico, the Caribbean, Central and South America. At a distance, turkey vultures appear to be black, but they're actually brown, taking on a golden hue in the right light. Their heads are featherless, the red skin exposed. Their black vulture cousins are black with a gray head. 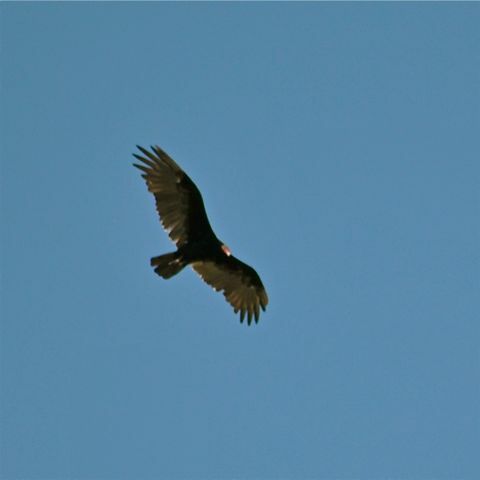 Turkey vultures are easy to identify in flight as they "wobble" along, their wings in a V shape. The undersides of their wings have a distinct dark and light pattern. Black vultures are more steady in flight and have white-tipped wings that become evident when they fly. Turkey vultures are large birds that can exceed 30 inches long, with a wingspan approaching six feet. They aren't as gregarious as black vultures and tend to feed one at a time. They have a keen sense of smell, which they use to locate dead critters. Black vultures don't, and find carrion by following the flight of turkey vultures. Favorite food: a recently deceased mammal, but they will eat older carrion as well as the occasional dead reptile, fish and other animals. Unlike the more aggressive blacks, turkey vultures rarely attack live animals. 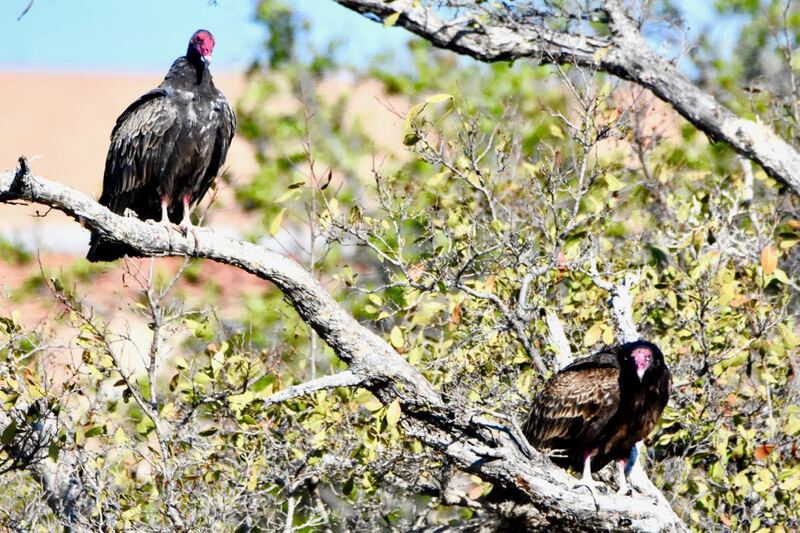 Turkey vultures nest on the ground in concealed or covered places, in fallen trees, thickets, old burrows, ledges and caves. It really doesn't make any kind of nest whatsoever. Clutches are one to three eggs, which require four to six weeks of incubation, performed by both parents. The youngsters are nest bound for two to three months. Both parents feed their offspring. Turkey vultures are members of the family Cathartidae.